They’ve delivered some of the most unique and important stadiums the world has ever seen. 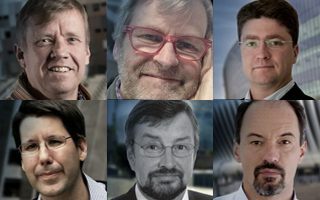 Now these six great architects are looking into this year’s Stadium of the Year nominees. This year’s edition of Stadium of the Year is special, because for the first time ever we’re adding the Jury Vote award aside of the Public Vote one. On February 19 we’ll have two stadiums recognized this way, unless of course both votes will reveal one winner. Please take a moment to learn about their work below and check back the competition site for a brief set of the Jury Vote regulations. Graduated from University of Witwatersrand, he joined Boogertman + Partners in 1998, currently director. Bob's strengths lie in the conceptualisation and delivery of large complex projects with a passion for the built environment and rational design. He has been honoured in participating in the following, WAF Judge – Category Sports & Leisure 2012, WAF Judge – Category Sports & Leisure 2014, Keynote speaker Mauritius Green Building conference 2011, India sustainability design Tour (Mumbai/Calcuta/Bangalore) 2011 and India – Hall of Fame Inductee 2010. Bob’s experience ranges from low density housing to office towers, mixed use urban design and transport. And of course sports stadiums, including the most prestigious Soccer City (FNB Stadium), the largest and one of the most distinguished stadiums in Africa, 2010 World Cup final venue. Mike Bell was project architect and lead designer on the 2010 FIFA World Cup Mbombela Stadium in Nelspruit. Mbombela was the only new 2010 stadium that was South African designed. Mike has been involved in various other stadium designs in Africa. He is a director with R&L Architects in Cape Town, South Africa. The company has several designs for African stadiums in its portfolio, including one for one of the continent’s most followed teams, Kaiser Chiefs. Mike worked in the USA for 5 years. Member of a famous family of architects, John Bontinck graduated from the University of Ghent in 1993. He continued education in Leuven before becoming a member of the Bontinck office in the home town of Ghent. Currently John is the CEO of Bontinck Architecture and Engineering with growing experience. Among numerous works by the company there’s one stadium, Ghelamco Arena. Born in 2002, the project was delivered in 2013 and experienced a very enthusiastic reactions, becoming Stadium of the Year 2013. Architect graduated at UFMG (Belo Horizonte, 1994), with M.A in Housing and Urbanism at the Architectural Association School (London, 1998). He has collaborated with various architects in Brazil and New York before establishing BCMF Arquitetos in 2001, associated to Marcelo Fontes and Silvio Todeschi, also graduated at UFMG. Since then, BCMF has been involved in the development of a broad range of outstanding projects, being acknowledged in Brazil and abroad as one of the leading practices of the new generation of Brazilian architects. In 2014 BCMF Arquitetos was listed by FAST COMPANY as the second most innovative company in South America. In recent years BCMF became the first Brazilian practice to prepare projects for three major mega events: Pan American Games (2007), FIFA World Cup (2014) and Olympics (2016). The multi-use Deodoro Sports Complex received high recognition, while spectacular redevelopment of the legendary Mineirao stadium earned the stadium a LEED platinum certificate as the second worldwide. Bryan joined Scott Tallon Walker Architects in 1978, after graduating from Dublin Institute of Technology and Trinity College Dublin, and became a director of the company in 1989. He has worked on many major building projects, with special skills in master planning, managing large and complex projects, as well as in conservation and restoration. His extensive experience covers projects as diverse as international sports stadia, urban redevelopment, and aquaculture to retail, educational, medical and commercial developments. He worked on the Aviva Stadium in Dublin (Stadium of the Year 2010), St. Andrew’s Stadium in Birmingham, reviewed the new stadium in Jeddah and was involved in several other sports venue projects. Architect, planner and founding partner at Dico si Tiganas architecture and design office, author of various projects from the sports area, including two stadiums and a multifunctional sports hall. He is also a teacher and lecturer for about twenty years at the Faculty of Architecture and Urban Planning, in Cluj-Napoca and had as well several international experiences. He is currently the president of the Romanian Order of Architects , institution inside which he has initiated the study of Architecture as a profession and of The Policy for Architecture in Romania. Cluj Arena, a work signed by Şerban Ţigănaş won the Architizer A+ Award in 2013 and it was nominated for Mies van der Rohe Award in the same year.